“Fall Back – Spring Forward” never changes but your night vision may. What can losing an extra hour of daylight tell us about our night vision? Plenty! Sure, we gain an extra hour of sleep, but as a result of the time change we’re driving back from work in the dark. And, that can reveal issues with the quality of our night vision. Most drivers have some difficulty with driving at night. Headlights from cars in front, or behind us can be bothersome creating glare symptoms or light sensitivity. If you are having difficulty with any of these issues please arrange for a comprehensive eye exam. This is important and obvious, as driving reaction is dependent on vision. Another issue that comes with aging is cataracts. Cataracts generally develop in people over the age of 55. They are a cloudy or opaque area in the normally clear lens of the eye according to the American Optometric Association. The good news is a non-invasive laser surgery will remedy common cataract issues. Here at Giles Eye Care we’ve found most patients just need a new prescription for contact lenses or glasses. 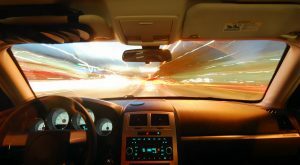 In many cases, we’ve found a simple upgrade of anti-reflective coating to their glasses will reduce the glare, halos and reflections of driving at night. We hope these suggestions help, as safe night driving is important to all of us. Fall Back – Spring Forward never changes but your night vision may. If you find you’re having night driving issues like glare, halos and reflections call now or contact us and make an appointment today. Be a safe driver. 2 Morbidity and Mortality Weekly Report, May 20, 2011; vol 60.